On the Trail of Bonnie and Clyde, Group History Ride! Break out the fedoras and the tommy guns! 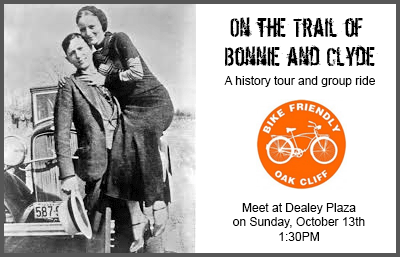 The next themed ride: On the Trail of Bonnie and Clyde, kicks off this Sunday, October 13th at 1:30PM. Once again, we’ll begin our ride at Dealey Plaza. Our trip will take us over the historic Commerce Bridge and up Beckley to the Singleton Bridge (aka: The West Dallas Viaduct), made famous in Bonnie’s poem “The Trail’s End”. From there, we’ll pass the famous Lillie McBride “Shoot-out” House, the Barrow Family Filling Station, visit Clyde and his brother Buck’s grave site, and more. Also, we’ll stop at the Chicken Scratch for drinks, and relaxation. Dressing up is advised!!! The ride is approximately 7 miles, with one crazy hill on Vilbig street. 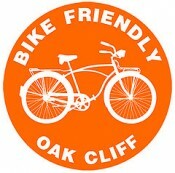 This ride will be weather permitting. If temperatures drop below 50 degrees, or it’s raining/windy, we’ll plan on rescheduling. Check back prior to the ride date for updates.